Six Acrobats | A Chines-themed slot with a unique twist from Microgaming. When you go to a circus, how many acrobats would you like to see performing at the same time? Through the Six Acrobats slot, Microgaming considers 6 to the ideal number. This is a slot game based on a Chinese circus and as you can already guess, the design is cartoonish, probably to appeal to the child aspect in every one of us. From the curiosity of how acrobats do their acts to the manner in which they decorate themselves to look edible, everyone will find something they love in this slot. Look out for free spins and a host of wild multipliers because they could unlock your riches. The reels of the Six Acrobats spin against a background of Chinese umbrellas and lanterns. Watch closely and you will soon discover that the game comprises of 5 reels and 9 paylines. Among the many symbols appearing on the reels, 5 acrobats represent 5 high-value symbols. If you thought that acrobats are only known by what they wear, you are wrong. Among the five acrobat symbols are expert balancers, jugglers, and knife throwers. The low-value symbols are K, A, Q, J and 10. 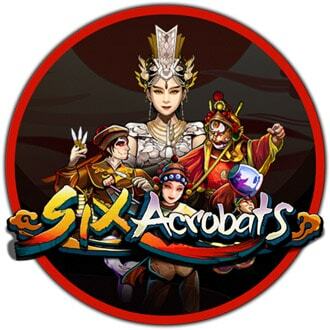 The logo of the Six Acrobats slot game is the wild symbol and when it appears, it will substitute all other symbols but the yellow acrobat scatter. To play this slot for money, you first need to set your bet amount which can be as low as 9p for each spin. The appearance of the wild symbol during the base game means that your winnings will be multiplied by 5. When playing a free spin round, it is possible for a player to get another 25 free spins and an additional one with each landing of a scatter. The free spins feature is the most popular reward in the Six Acrobats slot. To trigger it, a player must land a minimum of 3 acrobats scatter symbols within the range of sight. For 3, 4, and 5 scatters, the reward is 15, 20 and 25 free spins. In case a wild symbol is involved in forming a winning combination during the free spin rounds, the win will be multiplied by 25. There is no doubt that Microgaming has a high-quality slot as far as the creation of Six Acrobats is concerned. It provides an avenue for players to interact with the fun aspects of Chinese culture and at the same time position themselves to win good money. Get entertained with the acrobatic acts but do not forget that you are in it for the money.